The Antoninus Journal (TAJ) is now accepting manuscripts for evaluation. Submissions will be welcome all throughout the year. However, the final date of acceptance and publication will depend on the ability of the authors to comply with the results of the peer-review process and the comments of the editor-in-charge for the manuscript. TAJ will now be available in both print and on-line versions through the UST Graduate School website. 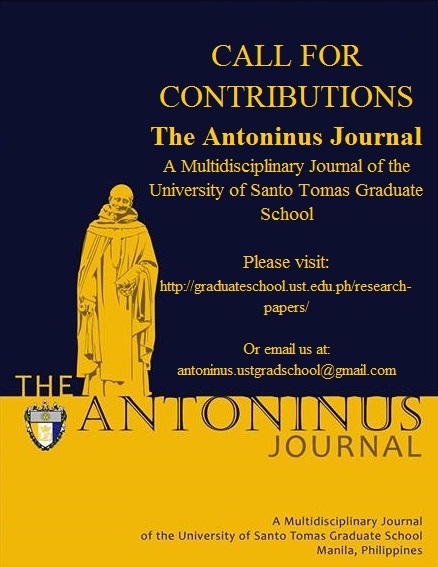 Contributors may submit their manuscript by email to antoninus.ustgradschool@gmail.com. Assoc. Prof. Rey Donne S. Papa, Ph.D.
Volume 3 is expected to be in press by February 2017. 1. The journal accepts research articles, including reports of faculty researches, excerpts from graduate theses and dissertations, and scholarly works such as theoretical and critical essays that reflect on or critique established theories, current literatures, and other emerging concepts across disciplines; Reviews, including book reviews, performance reviews, and the like. 2. The article should be accompanied by a 200-word abstract with a list of not more than 6 key words. Articles written in Filipino should be accompanied by an abstract in English. The article should be from 4,000 to 6,000 words in length. 3. Submissions may be sent in MS Word format using either Arial or Times New Roman font style at 12 font size. The journal requires authors to strictly conform to the citation styles of the American Psychological Association (APA) for articles in the humanities and the social sciences and the Harvard format for natural and health sciences. 4. Manuscripts should be original and have not yet been submitted to other journals nor have appeared in abridged or slightly similar form in other publications. Authors also bear the responsibility of securing the permission of concerned institutions and individuals who may have any claim on copyrighted materials such as photos and excerpts from primary documents.